When brides and grooms look at my Peterborough wedding photography portfolio they notice right away that it features special moments -- the groom reaching for a tissue as his future wife walks down the aisle, the flower girl dancing alone in a corner of the church, or the bride's grandmother admiring her veil and dress, for instance. While these are certainly the foundation of my work taking wedding pictures, I do make time for a few formal portraits. These are the images most often framed and hung on the walls in my clients home. They also make excellent gifts for the wedding party. I have been visiting Millennium Park since I was a child and have always loved that it is a scenic escape from the downtown urban core, but also centrally located. If you walk the trails far enough you will arrive at Little Lake Park, the site of Peterborough's famous Little Lake Music Fest, a long-running outdoor concert series. 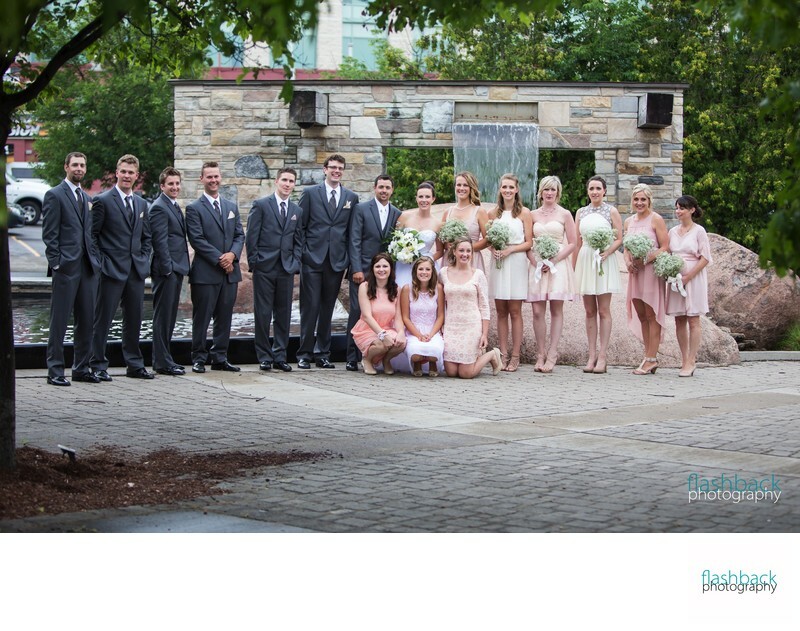 This bridal party portrait, taken at Millennium Park in Peterborough, was certainly tricky to organize with many people involved and a busy street corner filled with tourists and moving vehicles. The Millennium Park fountain is so iconic in the Kawartha Lakes Region and therefore including it the wedding day photos was a high priority. Behind the fountain is a parking lot that is not too pretty and therefore I stood far back from the bridal party and used a tree to hide some of the parked vehicles. In addition to this arrangement with the groomsmen on one side and the bridesmaids on the other, I also photographed the wedding scene by mixing up the genders to give a traditional formal portrait a modern twist.